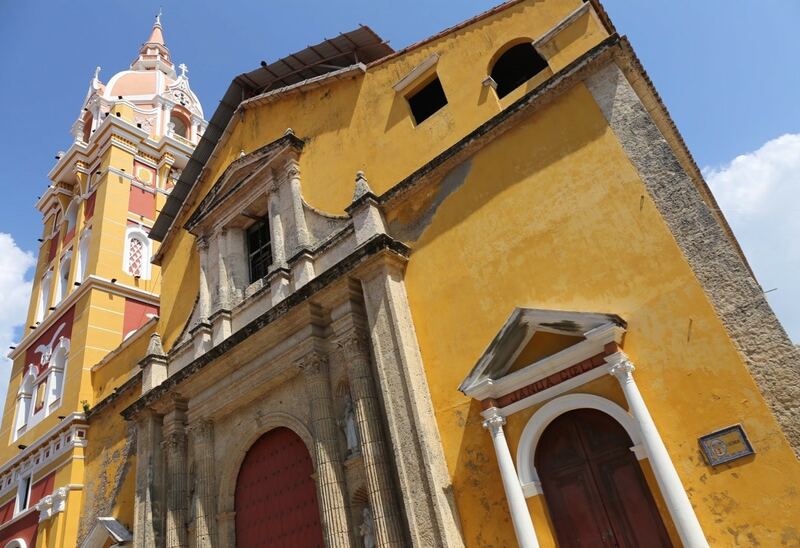 One of Latin America’s most beautiful cities, Cartagena offers an incredibly enticing blend of romantic and colonial architecture, gourmet dining, all-night partying and beaches. 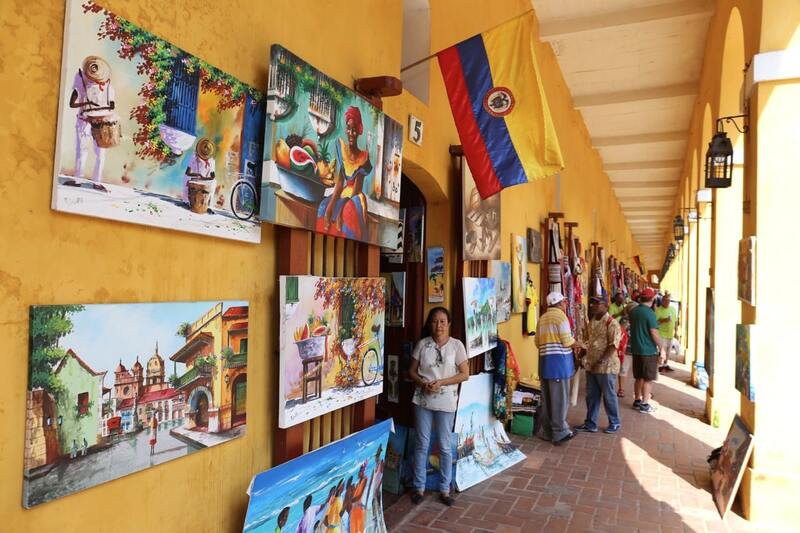 Tourism has exploded in the last decade, but the city that inspired Love in the Time of Cholera, and much of the oeuvre of long-time admirer Garbiel Garcia Marquez, has somehow retained its rich, often irreverent Colombian character. Some of the most expensive boutique hotels on the continent share street space with local beers shops and carts selling shrimp cocktails; its gorgeous mansions are lined with white, green and tangerine tinged Spanish balconies of carved wood, festooned with pink bougainvillea; the sound of salsa and beating drums pervades the always scorching-hot streets. It’s impossible not to be overwhelmed by the sheer magic of the place. 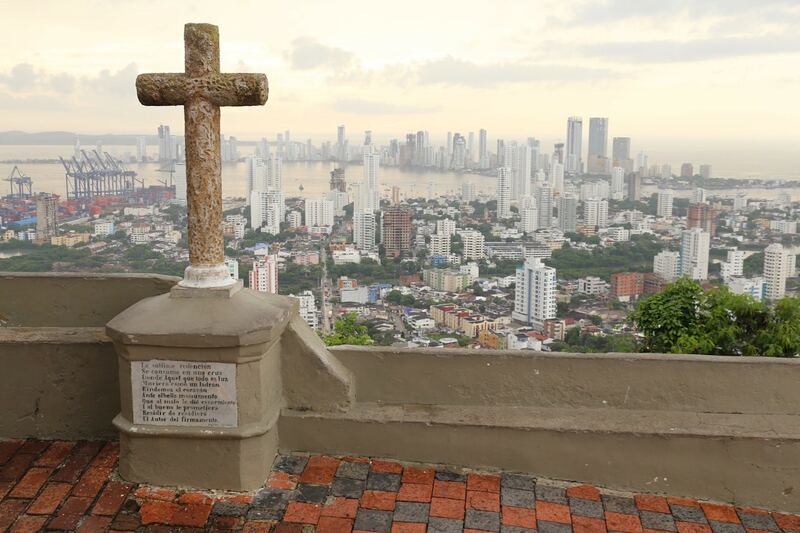 Months before flying to Cartagena I researched the region using the Rough Guide to Colombia. I’ve been using Rough Guides for years and love that they cover all budgets, from thrifty guesthouses to luxurious resorts, appealing to backpackers and well-heeled travellers alike. 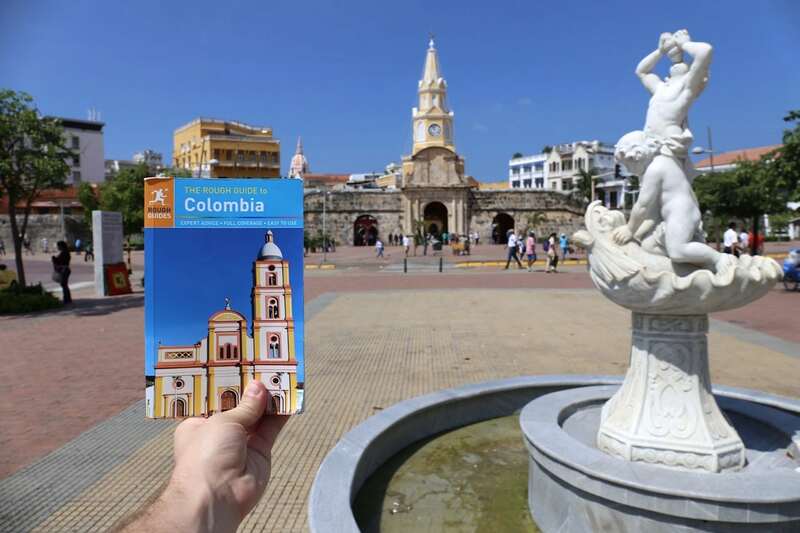 The Rough Guide to Colombia has more than 50 full-colour maps, along with suggested itineraries and regional highlights. It was an invaluable resource when adventuring through Cartagena on the solo. The authors painstakingly researched all of the city’s top attractions and offer helpful tips such as safety warnings (don’t walk up to Convento de la Popa, it zig-zags through a dangerous neighbourhood) and taxi rate info (since most drivers don’t use meters, attractions outside of the old walled city include an estimate on how much you should be paying so you don’t get ripped off). Each morning I’d sip a frothy cappuccino at breakfast while whisking my way through chapters dedicated to Colombia’s fascinating history, finger-licking-good culinary offerings and colourful indigenous communities. It’s a handy must-have guide that keeps you informed every step of the way. 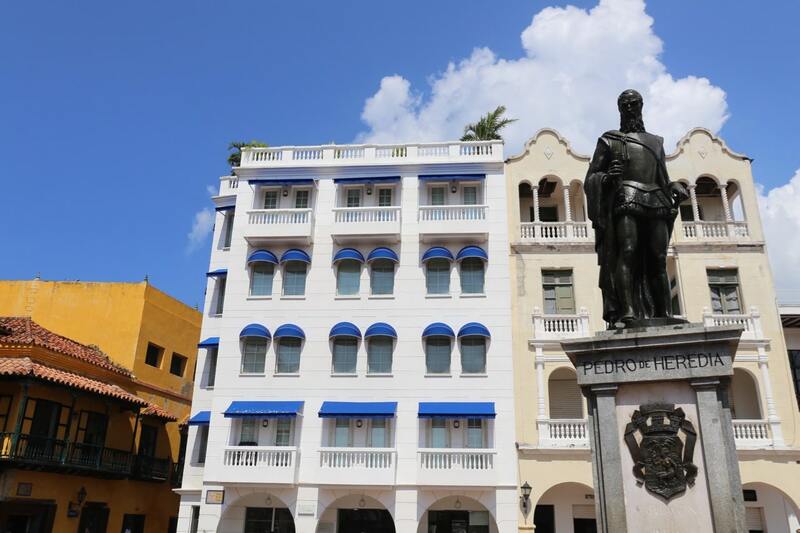 If Cartagena’s stock of colonial properties doesn’t appeal, try Allure Chocolat Hotel, a stylish, contemporary boutique hotel located a stones throw from the walled city. Allure is the boutique offshoot of luxury hotelier Karisma which features a portfolio of sun-soaked resorts in other Caribbean destinations such as Mexico, Dominican Republic and Jamaica. The Karisma brand distinguishes itself by offering a stellar culinary program at each of its resorts. 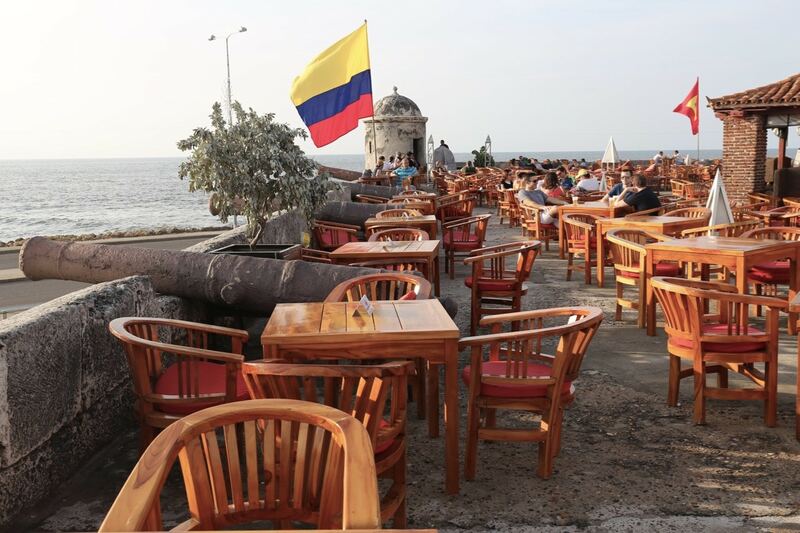 In Cartagena the Allure Chocolat is perhaps best known for its rooftop where tan fans lounge by petite pool overlooking the city’s jaw dropping skyline. Hop up at the bar and sip your way through a trilogy of refreshing cocktails such as the sweet Mojito Chocolate, fruity Kiwi Wine Bramble and mezcal muddled Love Cucumber. Once the sun has splashed across the horizon tip toe downstairs to enjoy a steak-tastic feast at the hotel’s signature restaurant Red Knife. The vibe inside feels ranch chic, perfect for sipping through a wine list that includes a colourful collection of bottles from Argentina, Chile, Spain and California. 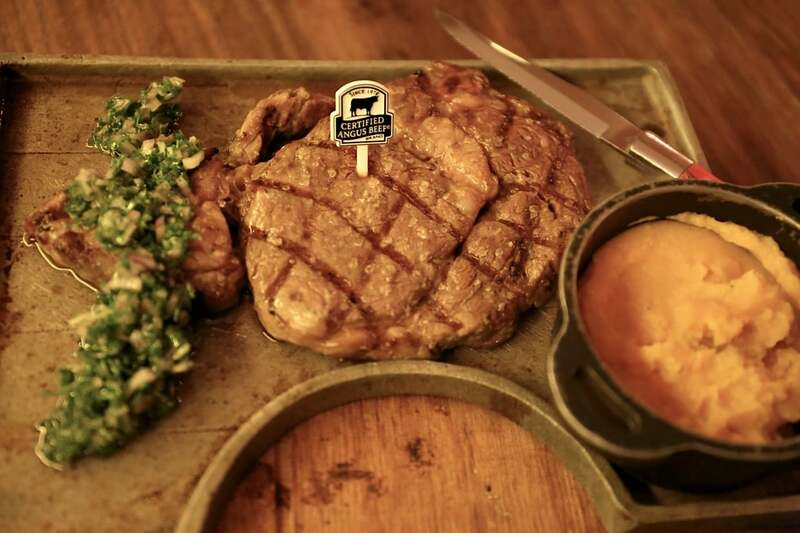 Red Knife is best known as a steakhouse which exclusively serves Angus Beef from the US (that ribeye served rare with vanilla whipped pumpkin and chimichurri is a dream) while also offering creative spins on Colombian classics such as Shrimp Ceviche flavoured with local lulo and a hearty soup featuring fried green plantain, chicharrones and plump pork belly. If Cartagena’s Centro Historico is likened to Manhattan, Gestemani offers the city’s hip Brooklyn vibe. Ten years ago the neighbourhood located just outside of the walled city, was considered an area worth avoiding but today it’s where all of the new shops, trendy restaurants and hotels are popping up. 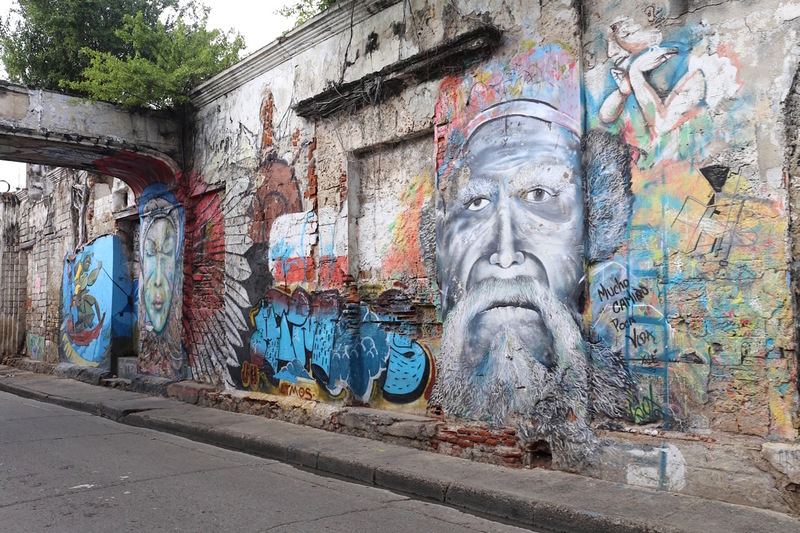 Take the time to wander through Gestsemani’s backstreets and you’ll find alleys filled with inspiring graffiti. Cartagena’s former slave-trading square faces the city’s main formal entrance, the triple-arched Puerta del Reloj. Though the Baroque-style gate dates from the Spanish period, the iconic tower on top was completed in 1888 (the Swiss clock was added in 1937). In the centre of the plaza stands a statue of the city’s founder Pedro de Heredia, while in the covered arcade, Portal de los Dulces, vendors pluck sweets of your choice out of a sea of huge glass jars. Housed in the seventeenth-century Almacen de Galeras, all red-brick and original timbers, the Museum de Arte Moderneo offers a refreshing break from Spanish colonial with a respectable collection of Colombian and Latin American art since the 1950s. Highlights include galleries dedicated to local boy Enrique Grau, Cecilia Porras and Alejandro Obgregon. 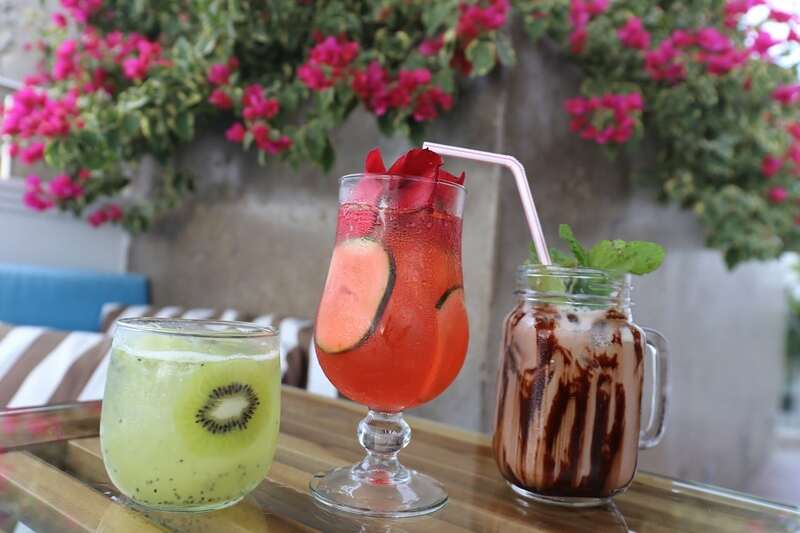 Popular with nostalgic Colombian tourists who enjoy the old-fashioned vibe (it’s food their grandmothers used to make) and Monteria-style dishes, La Cocina de Pepina is Cartagena’s most famous cheap-meets-cheerful restaurant for those looking to sample authentic local dishes. 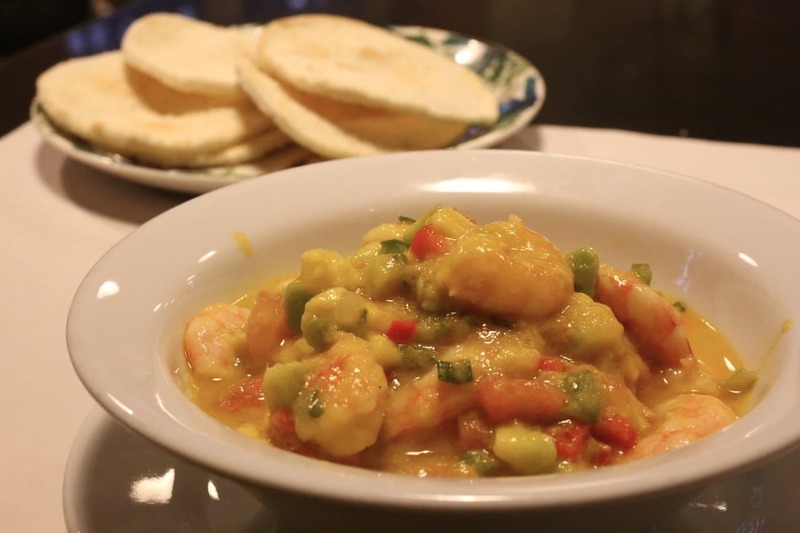 Maria Josefina’s cheese and ham soup is a real classic, as is the pork ribs, stuffed peppers and poached shrimp in avocado sauce. 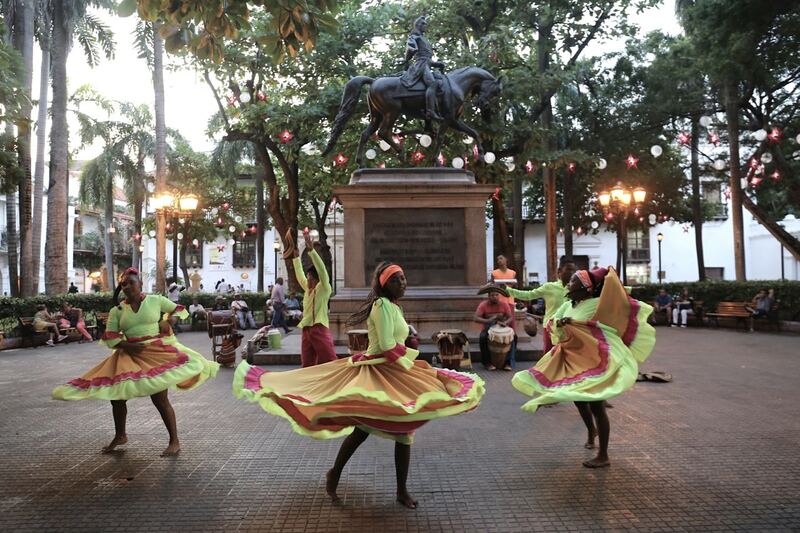 Locals and tourists alike come to find respite from the heat in Plaza de Bolivar, a green, shaded square with a statue of Simin Bolivar on horseback as its centrepiece. 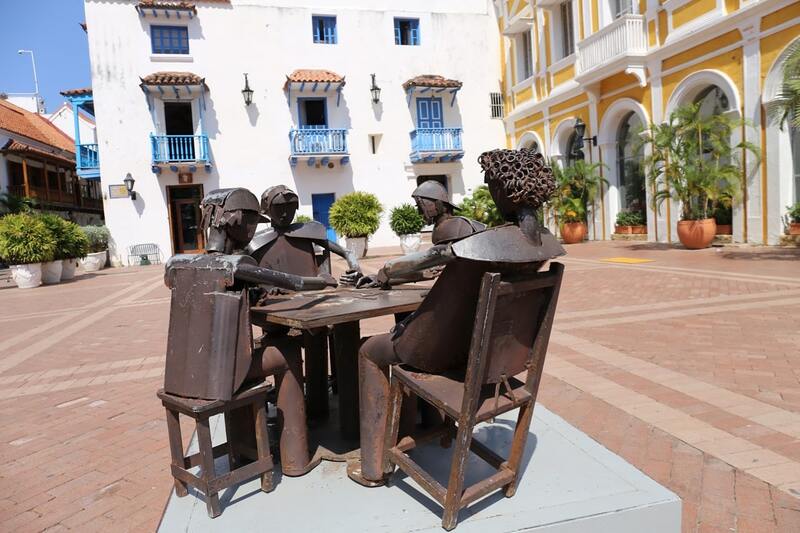 The plaza is surrounded by some of Cartagena’s most opulent buildings, notably the old Palacio de la Inquisicion, as well as several pricey emerald and jewellery stores. Pay a visit after sunset and you’ll find local dancers and drum band dazzling crowds to traditional folk songs. Looming above the northeast corner of the Plaza de Bolivar is the city’s fortress-like cathedral, whose construction began in 1575, but which wasn’t completed until 1612 due to setbacks such as its partial destruction by cannon fire in 1586 by Sir Francis Drake. The vast interior is airy and pleasantly austere, though the wooden altarpiece is certainly ornate, embellished with gold leaf. 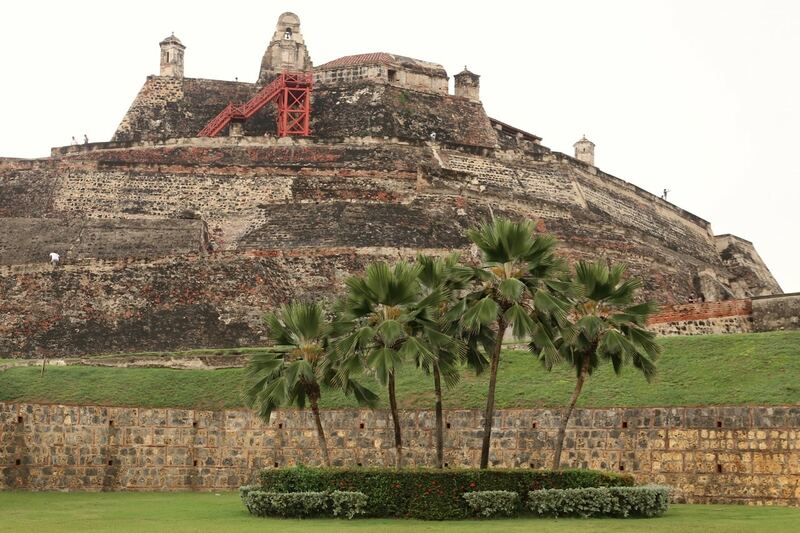 The largest and most important fort defending Cartagena was Castillo San Felipe de Barajas, a mountain of stone looming just east of the walled city like a Mayan pyramid. This incredible feat of engineering was built in phases beginning in 1657, and substantially reinforced in the 1760s. The panoramic views from the top, with the whole city visible, are worth the entry fee alone. For a bird’s-eye view of Cartagena take a taxi 2km northeast of the Castillo to Convento de la Popa, which, wrote Gabriel Garcia Marquez, “always has seemed on the verge of falling over a precipice.” Lying atop a hill known as El Cerro de la Popa, the restored whitewashed convent chapel, founded by the Augustinians in 1606, is clearly visible from almost anywhere in the city. In the northeast corner of the walled city, Las Bovedas are 23 mustard-coloured vaults, built into the city walls between 1792 and 1796, and used variously as munitions storage, a jail and – their current incarnation – as craft and souvenir shops. If you like to buy trinkets to take home this is the place for you! Perched on the city’s stone walls, with spectacular 360-degree views of the Caribbean and the Old City’s elegant colonial buildings, this is the ideal location to lounge on an open-air couch with a sunset mojito surrounded by fashionable locals. Food is served until 1am and DJs take over from 10pm. Some 35km southwest of Cartagena lies an archipelago of small coral islands known as the Islas del Rosario, sunk in transparent turquoise waters. In total there are 27 islands, most of them private islets barely large enough for a bungalow. Most travellers experience the islands on a day-trip from Cartagena which depart at 9am and return to the city before 5pm. 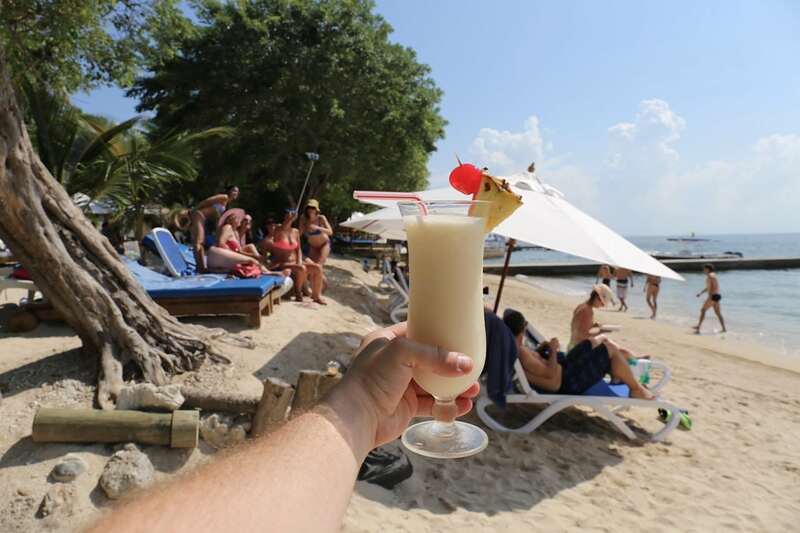 If you’re keen on a beach break a day trip to the islands is an excellent option. Depending on your mood, spend a few hours snorkeling under the deep blue or enjoy a bit of tan time while sipping a rum spiked Pina Colada.